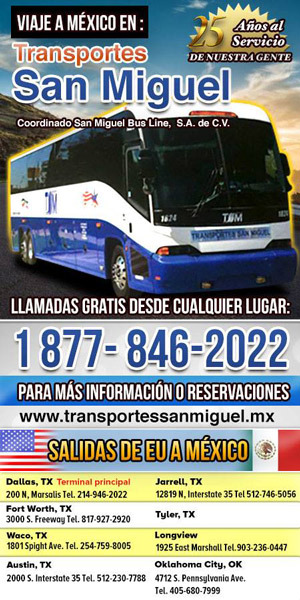 In the U.S. and Mexico, Transportes San Miguel is operated by San Miguel Bus Line (TSM), Dallas, TX U.S. DOT No. 005999036 C (for routes operated in and through the states of Oklahoma, Texas in the U.S. and Guanajuato, San Luis Potosi, and Jalisco in Mexico). Reservations and seating aboard Transportes San Miguel buses operated in interstate, intrastate or foreign commerce is without regard to race, color, creed, or national origin. 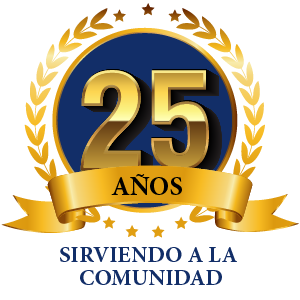 The information published on transportessanmiguel.mx is provided as a convenience to visitors and should be used for information purposes only and is subject to change without notice. Transportes San Miguel will make every attempt necessary to ensure that the information contained on its website is current, accurate and complete at the date of publication, no representations or warranties are made (express or implied) as to the reliability, accuracy or completeness of such information. Transportes San Miguel; therefore, cannot be held liable for any loss arising directly or indirectly from the use of, or any action taken in reliance on, any information appearing on this website. In addition, no warranty is given as to the freedom of this website from errors, defects, viruses or other malicious programs or macros. Transportessanmiguel.mx reserve the right to make changes or corrections, alter, suspend or discontinue any aspects of our website or the content or services available through it (although we will honor any existing reservations or provide a refund in the event of unavoidable cancellations). Unless explicitly stated otherwise, any new feature, content, products and services offered shall be subject to these terms and conditions. Website links from transportessanmiguel.mx exist for convenience and information and transportessanmiguel.mx makes no representations regarding, or accepts any responsibility or liability for the products, services or information (or any reliance on it) contained on any such site. Transportessanmiguel.mx does not guarantee that third party websites are free of infection from any virus, harmful component, or other code or computer programming routines that contain contaminating or destructive properties or that are intended to damage, surreptitiously intercept or expropriate any system, data or personal information. The existence of a link to another website does not imply or express endorsement of its provider, product or services by transportessanmiguel.mx. As a condition of your use of transportessanmiguel.mx, you agree that you will not use this website for any purpose that is unlawful or prohibited by these terms and conditions. 1. You must be 18 years of age or over to make travel reservations and physically able to board the bus. 2. Reservations made at any of our offices cannot be refunded or cancelled except where Transportes San Miguel has materially failed in its delivery of the service offered. 3. Customers wishing to change a reservation must do so at least 24 hours prior to the departure time of the existing reservation. A US$35 exchange fee is charged for each ticket being changed. The cost of the initial reservation will be credited against the subsequent reservation, less the $35 fee. In the event that the subsequent reservation be less expensive than the initial reservation, no payment or further credit will be made to the customer and all unused credits will be forfeited. If the initial amount paid is less than the cost of the subsequent reservation the customer must pay the difference when completing their new reservation. 4. Reservations are only valid on the trip(s) stated. 5. All children under 17 years of age must be accompanied by an adult (17 years of age or over) when travelling on Transportes San Miguel. 6. Passengers are required to present a valid bus ticket provided at the time of purchase, when boarding Transportes San Miguel buses. 7. If we have reason to suspect the fraudulent use of a confirmation, we reserve the right to refuse travel on our vehicles. No refund will be made in relation to any confirmation refused due to fraudulent use. 8. Customers are required to be at their departure point at least 60 minutes prior to the scheduled departure time. This allows Transportes San Miguel staff to board customers in a timely manner avoiding any delays that may impact on the departure of the vehicle. 9. All Passengers and bags are subject to check. Customers are advised that Transportes San Miguel will accept up to 100 pounds of luggage per passenger’s reservation. For guidance each bag checked must not exceed 62 inches when adding the total exterior dimensions of the piece (length + width + height) and should not weigh more than 50 pounds. Passengers can also take on board one (2) small carry-on bag that will fit in the overhead storage compartments and/or under the seat. Maximum bag sizes that are commonly used for airline carryon, such as wheeled rectangular bags are typically too large to be taken on board the bus and will not be permitted in the passenger area. We suggest a bag with dimensions no larger than a briefcase as being about the correct size for carriage onto the bus. All luggage bags should be locked and we recommend that a TSA approved locking device be used, particularly if crossing international borders. We also recommend that you label your luggage with your name, address and contact number. Please be advised that passengers wishing to travel with more luggage than specified above will have to pay an excess baggage fee or items may be refused. No refunds will be issued in respect of travel plans canceled by the customer as a result of their excess luggage being refused. The carriage of additional luggage is at the discretion of the operator or dispatcher and usually dependent on the available space once all legs of the bus journey have been considered. In the interests of safety and the prevention of injury to employees and associates, no pieces of luggage over 50 pounds in weight are allowed – regardless of whether additional reservations have been purchased or not. Medical devices required for travel are carried in addition to the luggage limitations. Children’s strollers may also be carried in addition to the luggage limitations, maximum one per passenger, provided that they are properly folded and capable of being stowed in the luggage compartment. Where additional luggage is accepted for travel by the bus operator or dispatcher, Transportes San Miguel does not guarantee that the luggage will be carried on any subsequent service the customer intends to use. No refunds will be issued in respect of travel plans cancelled by the customer as a result of their excess luggage being refused on subsequent services. Bicycles are not permitted on Transportes San Miguel. Customers may not transport in their baggage or otherwise any items that are inherently dangerous, including any hazardous materials as that term is defined by the US Department of Transportation or weapons of any kind. Luggage is subject to inspection when crossing international borders. You will be asked to declare any items subject to duty upon crossing the border. Passengers must claim their luggage at the border crossing point for clearance through customs before being allowed to proceed across the border. No luggage is allowed across the border unless claimed by a passenger. Our maximum liability to you for any loss or damage to your luggage is US$250 per passenger for any such loss or damage to luggage, and Transportes San Miguel will only be responsible to reimburse passengers up to the maximum liability limit in the event of negligence on the part of Transportes San Miguel. 10. Transportes San Miguel is unable to carry animals, with the exception of trained service animals that allow Passengers with Disabilities to perform necessary activities. Service animals must be properly harnessed and under the direct control of the passenger at all times. 11. Transportes San Miguel is not responsible for delays or cancellations caused by traffic or road conditions, weather or other causes over which it has no control. 12. Passengers are allowed to bring food and non-alcoholic beverages on board.Passengers are not permitted to consume or bring alcoholic beverages on board. 13. Smoking is not permitted on Transportes San Miguel buses. All prices are shown in US dollars. Transportes San Miguel, one-way fares. Fares will vary by reservation date, day of travel and demand for seats. Fares are subject to change without notice. For changes to existing reservations a US$35 change fee. Any change to your reservation may result in a fare increase. However, all trips will remain competitively priced offering excellent value for your money. We hope you find this site useful and easy to use. Should you have any questions, comments or suggestions then please contact us at info@transportessanmiguel.mx. Failure or delay by us to enforce an obligation or exercise a right under these terms and conditions does not constitute a waiver of that obligation or right. If any provision or term of these terms and conditions shall become or be declared illegal, invalid or unenforceable for any reason whatsoever, such term or provision shall be divisible from the other terms and conditions and shall be deemed to be deleted from them. We may alter these terms and conditions from time to time and post the new version on our website, following which all use of our website will be governed by that version. It is your responsibility to check the terms and conditions on the website regularly and prior to making a reservation. Unless specifically stated otherwise herein or required by law, Transportes San Miguel shall not be liable for any consequential, compensatory, indirect, incidental or punitive damages arising out of or in connection with the performance of its obligations under these terms and conditions. Transportes San Miguel has the right to cancel reservations (whether or not confirmed) of any customer whenever such action is necessary to comply with any governmental regulation, upon any governmental request for emergency transportation in connection with the national defense, or whenever such action is necessary or advisable by reason of weather or other conditions beyond Transportes San Miguel’s control, including Force Majeure events. (2) The nature of the property or defect therein. incidents to a state of war. Persons traveling across the U.S.-Mexico border should ascertain information on documents needed to cross the border from the relevant U.S. and Mexican government agencies; as such requirements are subject to change. A valid passport is required for citizens of any nation, including citizens of the United States and Mexico, to cross the border in either direction between the United States and Mexico. Passengers are advised to consult with their government if they seek to cross the border without a valid passport. For U.S. Government information, passengers should consult with U.S. Customs and Border Protection at www.cbp.gov. For Mexican Government information, passengers should consult with the Mexican Embassy in the United States at http://consulmex.sre.gob.mx. A guardian traveling with children must provide proof of custody or notarized parental authorization for travel. An adult accompanying a child who is neither a parent nor guardian of the child should have written permission from a parent or guardian to accompany the child across the border, including the name and contact information of the parent or guardian. Luggage is subject to inspection when crossing international borders. You will be asked to declare any items subject to duty upon crossing the border. Transportes San Miguel is not responsible for any luggage crossing international borders. Passengers must claim all luggage bags at the border crossing point before proceeding. No luggage is allowed across the border unless claimed by a passenger. Transportes San Miguel, WILL NOT provide free transportation to any passenger denied entry across an international border. 1. Government Request or Regulations: Whenever such action is necessary to comply with any government regulation, security directive, or any governmental request for emergency transportation in connection with the national defense. 2. Force Majeure and Other Conditions: Whenever such action is necessary or advisable by reason of weather or other conditions beyond Transportes San Miguel control including, but not limited to, acts of God, force majeure, strikes, civil commotions, embargoes, wars, hostilities, terrorist activities, or disturbances, whether actual, threatened, or reported. 3. Across International Boundaries: Whenever a customer is travelling across any international boundary if: – The government required travel documents of such Customer appear not to be in order according to Transportes San Miguel’s reasonable belief; or such customer’s embarkation from, transit through, or entry into any country from, through, or to which such customer desires transportation would be unlawful or denied for any reason. D. Persons with acommunicable disease or infection known or reasonably believed by Transportes San Miguel to pose a direct threat to the healthor safety of others. En Transportes San Miguel Coordinado San Miguel Bus Line, nos esforzamos por ofrecer a nuestros clientes el mejor servicio posible. Sin embargo, su cooperación es necesaria para alcanzar tales resultados. Por lo tanto, es de suma importancia que conozcan nuestras siguientes directrices de conducta e información de viajes. Llegar 30-60 minutos antes del horario de salida del autobús, con el fin de evitar el riesgo de perder su viaje. Todos nuestros viajes tienen un horario definido y hacemos todo lo posible para salir puntualmente y así poder servir a nuestros clientes lo mejor posible. Sin embargo, en días con mucha actividad y en días festivos, los horarios pueden variar. Todos los pasajeros deben registrarse en la recepción antes de abordar el autobús para poder viajar y se recomienda llegar 60 – 90 minutos antes del horario de salida. Viajar con nuestra empresa es fácil: Los pasajeros se deben mostrar por lo menos 60 ‑90 minutos antes de la salida. Conexiones de salidas se detendrá en otras oficinas. Los autobuses no se detienen por cualquier otra razón. Lea a continuación para obtener más detalles y algunas cosas a tener en cuenta. • El autobús se detendrá en algunas otras oficinas de paso a fin de recoger pasajeros. • La unidad no se detendrá por alguna otra razón. • Los boletos deben ser presentados al subir al autobús. • Cada pasajero necesita su boleto para viajar. 1. Todos los menores deben ir acompañados por un adulto tanto para comprar un boleto como para viajar; ya que es necesario que una persona mayor se presente con ellos al solicitar el permiso correspondiente para ingresar a los Estados Unidos. 2. Padres o tutores son responsables de notificar a sus parientes a cerca de la llegada de sus hijos para evitar la posibilidad de que el niño deba de esperar fuera si la terminal está cerrada. 3. Nos reservamos el derecho a solicitar un comprobante a fin de verificar la edad. 1. Es recomendable que no viajen solos. 2. Por su salud y seguridad, se sugiere que no viajen con mucho equipaje y que éste sea de tamaño normal, no pesado; con el fin de que les sea fácil manejarlo. 1. Los pasajeros sin boletos. 2. Las personas que están parcial o totalmente en estado de ebriedad, o bajo la influencia de drogas, estupefacientes o sustancias químicas de cualquier tipo. 3. Gente demasiada sucia y / o personas que presenten una notable falta de higiene personal. 4. Las personas con aspecto indecoroso u ofensivo, con comportamiento agresivo hacia los demás, que las demandas de una manera bastante abrupta, de manera incivilizada, cuyo lenguaje es inadecuado o incluso obsceno, actuando de una manera amenazante, insolente o haciendo uso de un tono de voz muy alto (gritando). 5. Las personas que viajan solas evidenciando signos de enfermedad grave (por ejemplo, sangrado, vómitos frecuentes, en la necesidad de ir al baño cada 15 minutos o menos). 1. Los pasajeros deben cumplir con las instrucciones a todos los conductores en todo momento. 2. Un conductor, dentro de lo razonable, ayudará a los pasajeros con el proceso de cargar y descargar su equipaje. Sin embargo, los pasajeros deben cooperar en esta tarea; puesto que la principal obligación del conductor es, en esencia, la conducción del vehículo y no el de la manipulación de equipaje propiedad de todo viajero. 3. Si en el momento de la salida, debido a circunstancias imprevistas, el pasajero es obligado a abandonar momentáneamente la zona de embarque, el / ella debe informar al conductor a la vez. De esta manera, el pasajero entonces le haría consciente al conductor de la situación lo que le permitió actuar en consecuencia. 4. El pasajero no debe conversar o distraer la atención del conductor mientras que él está conduciendo el vehículo. Tal situación es una grave violación de las leyes vigentes que, en caso de un accidente, puede ser un pasajero responsable del mismo, por lo tanto, se obliga a hacer frente a fuertes multas o encarcelamiento, o ambos. 5. Su comportamiento dentro del vehículo es de suma importancia ya que es una gran influencia sobre la capacidad del conductor para concentrarse en su trabajo. Los pasajeros cuyo comportamiento altere el orden y / o la paz interior del vehículo se desembarcará a la vez. Si el pasajero infractor se niega a tal efecto, será expulsado de la unidad; por lo que el conductor se verá obligado a llamar a la policía, sin más consideraciones. 1. Por cada boleto se aceptaran 2 piezas de Equipaje de 25 Kgs cada una como máximo. 2. La Documentación se realizara únicamente por personal de la Empresa. 3. Exija su contraseña; sin la presentación de ella no será entregado su equipaje y tampoco podrá realizar reclamación alguna. 4. El equipaje documentado será entregado al poseedor de la contraseña de equipaje. 1. El cálculo del costo de exceso de equipaje se realizará por el personal de la terminal correspondiente. 2. En caso de solicitarlo se pagará en Caja y se entregará su comprobante de pago. 3. El exceso de equipaje se sujetará a disponibilidad de cupo en el Autobús. 2. No incluya artículos de valor, dinero, joyas, medicamentos vitales ni artículos perecederos o líquidos. 3. La documentación de artículos frágiles es bajo riesgo del pasajero. 4. Verifique que la contraseña descrita en la etiqueta de documentación de equipaje corresponda con su lugar de destino. 5. Al recoger su equipaje verifique que la cantidad de contraseñas coincida con el número de piezas, así como que la serie de su contraseña sea la misma que la de la etiqueta adherida al mismo. 2. Drogas de cualquier tipo. 13. Venenos y sustancias infecciosas. 1. La reclamación por pérdida total o parcial de equipaje se tendrá que hacer inmediata a la finalización de su viaje, después de que el autobús haya partido no se aceptarán reclamaciones. 2. La reclamación de equipaje se sujeta únicamente al equipaje documentado. 3. No nos hacemos responsables por equipaje no documentado o que viaje con usted en el área de pasajeros. 4. El proceso de recuperación dura aproximadamente 72 horas. En caso de no ser localizado, se procede a una indemnización determinada en base a lo estipulado en la ley de comunicaciones y transportes. 1. El monto de indemnización por pérdida total o parcial de equipaje será de 15 días de salario mínimo vigente en el D.F. en base a la Ley de Caminos y Puentes y Autotransporte Federal. 2. La indemnización se limita únicamente a equipaje documentado, presentando contraseña. 3. La responsabilidad por pérdida, demora o daño al equipaje es limitada, a menos que un valor superior sea declarado con anticipación y se paguen los cargos adicionales. Para ciertos tipos de artículos no se puede declarar un valor mayor. 1. Cada pasajero adulto se le permite llevar dos (2) piezas de equipaje de no más de 50 libras (25kg.) de equipaje de mano. 2. Los niños se les permite llevar una (1) pieza de equipaje de no más de 25 libras (12,5 kg.) de peso y no más grande que 18x18x18in. (90x90x90cm.) en dimensiones y una (1) bolsa de mano. 3. Todas las piezas deben estar bien cerradas y aseguradas de manera manejable y seguro para el transporte. Artículos sueltos no se puede llevar, de lo contrario, se renuncia la responsabilidad del transportista para tales artículos. 4. Será cobrado un costo extra por equipaje adicional, cuando se rebase la cantidad permitida. 5. En caso de portar un equipaje mayor a las medidas permitidas, se requiere la aprobación del gerente o supervisor. La aceptación de piezas de gran tamaño dependerá de la capacidad del maletero de la unidad, pudiendo tener un cargo adicional. 6. No somos responsables por objetos o prendas olvidadas. Los daños causados por embalaje deficiente o la falta de sujeción de equipaje. Artículos no registrados, no declarado o ilegal dentro o fuera del equipaje. Los artículos de valor, incluyendo pero no limitado a: Dinero en efectivo, cheques de viajero, cheques de gerencia, cheques personales, tarjetas de crédito, órdenes de pago y / o cualquier otro instrumento monetario emitido por las entidades bancarias Joyería, piedras preciosas y / o metales preciosos, Piezas de arte y / o antigüedades, Documentos, Productos perecederos, Instrumentos musicales y todos los elementos electrónicos. Todos los objetos de valor deben ser cargados por los pasajeros en todo momento. 8. Está totalmente prohibido portar o hacer uso de cualquier clase de drogas, no se permite ningún tipo de armas, explosivos, materiales o sustancias flamables, corrosivos, irritantes y/o radioactivos, entre otros. La empresa no se hace responsable por la negación del Permiso correspondiente para ingresar a los Estados Unidos.